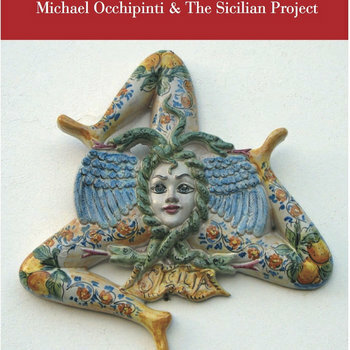 Michael Occhipinti’s Sicilian Jazz Project has been dazzling audiences world-wide with an intriguing mix of rare Old World Sicilian folk material and the New World sounds of electric guitars, chamber music, funk and reggae grooves, and modern jazz. Using music sung by Sicilian fishermen, sulphur miners, and folk musicians as a starting point, the music is like a trip on the Mediterranean that somehow manages to detour to Mali, Jamaica, and Toronto. Touring with Ilaria PILAR Patassini in 2017! In June and July 2017, the Sicilian Project toured Canada for the fourth year in a row with special guest Ilaria "Pilar" Patassini. We started off with a launch concert for the Hudson Music Festival in Hudson, Quebec, then performed in a concert at Montreal's Centre Phi organized by the Italian Cultural Institute who supported Pilar's trip to Canada. From there the group moved east, performing at Toronto Downtown Jazz Festival, and The Waterloo Jazz Room's Festival, before heading to western Canada for concerts in the Rockies and the Okanagan Valley, finishing off on British Columbia's Sunshine Coast. Every concert had great crowds, and all of us had a blast! The musicians varied slightly from the east to the west and included bassists Roberto Occhipinti and Scott Kemp, Louis Simao (accordion), and drummers Mark Kelso, Blair McKay, and Tony Ferraro. The concerts ranged from beautiful historic theatres such as The Heritage Playhouse in Gibsons, to modern performance spaces such as the Canmore Artspace, to fantastic house concerts such as the one we did in beautiful Lions Bay BC (see clip below). “Like taking a cruise on the Mediterranean that somehow managed to stop in Bamako, Mali, Kingston, Jamaica, and Toronto, Canada. Muorica is the brilliant follow up to Michael Occhipinti's award winning "The Sicilian Jazz Project"and creates an eclectic sound all its own. Bringing together Sicilian poetry and folk songs with his own interests in jazz, global grooves and chamber music, Michael Occhipinti has assembled a stellar cast to create his new Sicilian Project. Featuring the passionate vocals of Dominic Mancuso and Pilar and such notable guests as clarinetist Don Byron, and the Cecilia String Quartet, the album is also a showcase for Michael Occhipinti's inventive guitar sounds and his refusal to be defined by any one genre.